Does anyone else have, or know the location of, a Walter Scott & Co. printing press? We have a single-revolution pony press and believe it is the only one remaining. The company is better known for its web presses. 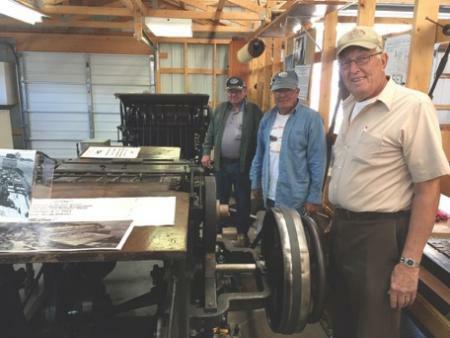 Our press, which had not been run since 1936, was powered up on Sept. 13, 2015. We found a chase that will work on it, and we have new rollers. 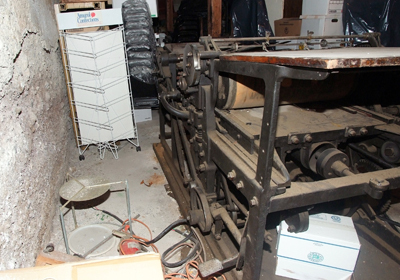 By the way, the press was in the basement of the former Bottineau Courant building in Bottineau, N.D., and had to be dismantled and carried piece by piece up out of the basement. Our crew re-assembled it in Braddock, N.D., in a day. I don’t know about the Walter Scott company, but congratulations on finding, moving, and restoring this beauty, and preserving a rare and still-useful piece of printing technology history. Looking in a catalogue of 19th Century Presses by Sterne there are several drawings of Scott cylinder presses but not your jobbing cylinder. Many a small printer would have a jobbing cylinder for poster work and local newspapers. Pages 103 to 106 cover newspaper, book and jobbing presses and on pages 238 to 240 are the web presses. 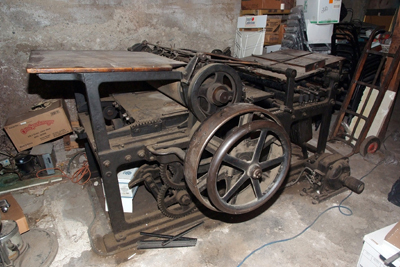 Also on page 254 is a Scott newsprint dampening machine. Printing on dry paper didn’t become common until the late 1800s. Here is a very similar press, if anyone is interested it is for sale (not by me), but i would be happy to put you in contact with the owner. I know this is an old post but the Walter Scott printing press factory was in Plainfield New Jersey. Maybe the town office or Chamber of Commerce would have info on what happened to any records of who purchased any of the inventory or blue prints from the factory.